Discussion in 'General breed discussions & FAQ' started by OkChickens, Jan 3, 2011. Most likely a white chicken with black fleck mixed in, kinda like a California White. Leghorns are Dominate White (like some game breeds) and is less efficient at covering Gold/Red pigment than Black pigment. Quote:This would only be on the small chance of the white leghorn masking Silver Duckwing or Columbian under the white, but most Silver based Extended black or birchen under the dom white which would give mostly white birds with black dots like draye said and they would develope red leakage as adults like you would get from crossing a black bird with a red bird. 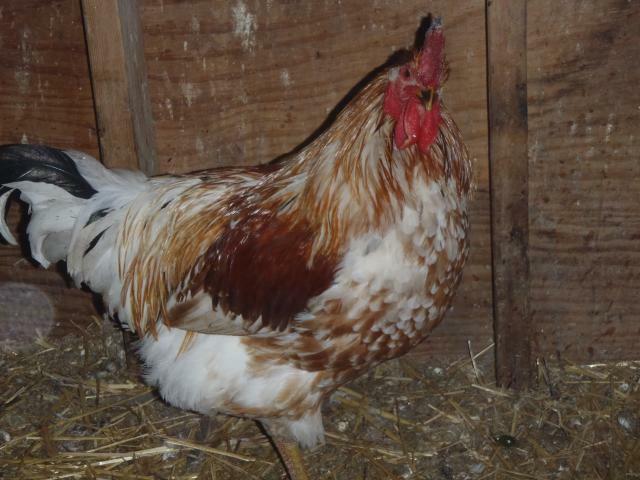 this is my rooster who is a cross between a red rooster and a California White hen: going along with what Rareroo said, this rooster was white as a chick with a few black dots. He's a very prettily patterned rooster. As this characteristic is dominant, crossing a pure white bird (I/I) with a colored bird gives birds with white plumage (I/i+). The initial color (black, fawn, wheaten, cuckoo) will be masked or veiled. This gene has most effect on black, however is not completely effective on red, which can result in the Pyle pattern. By selection we can obtain Dominant White in a homozygous state, the main breed based on this gene are the White Leghorn, it is also found in some White Marans stocks. Dominant White is known as a leaky gene as it doesnt fully suppress black and the odd feather may appear. Just got some rhode island red x white leghorn chicks. Don't know which parent was the hen or rooster but the chicks are almost pure white with a couple of black specks, if any at all. They lay white eggs. I crossed my RIR rooster to my white leghorn and I got golden comets no black in their feathers at all. To get a California white you take a California Grey Rooster and breed it to a White leghorn hen. they to have black flakes in their feathers. If you take a Black Australorp rooster and breed it with a white leghorn hen you'll get what is called a Austra white they are big like australorps and white but also with black flakes in their feathers.